Some time in the last couple of days I realised that I had been getting stuck with this because I kept wanting all the big circles lined up. Now, my original little sketch wasn't all neatly boxed off like that, but I think because the first chunk I put together happened to work that way I became too fixated on keeping it going. And that gets hard - or it did for me: firstly because once I'd decided on those vertical runs of the medium circles they threw the whole thing out but also because I kept wanting to do other things that would mess up that perfect grid. Anyone who has watched me work for more than about 5 minutes knows that I am not normally a perfect grid sort of person, yet I got sucked in. I am glad to say, though, that I have given myself a stern talking to and will not be obsessing about this any more. The one circle that isn't lined up (top right corner) seems to me to work fine, so I will be letting others wander a bit too. I really like this. The colors, the design concept, and the layout all really appeal to me. Whatever you're doing, grid or non-grid, it's working here! I absolutely love this. Keep doing what you're doing - it's working! This is just beautiful! With each new circle, stripe...it gets better and better! I am so inspired by your design, colors and fabrics! Thank you for sharing! I can relate to your need for order but I hope you continue to stay loose 'cause this is really evolving into something lovely! Again you've got it right. Haha! You showed you who's the boss! It took me a while to even figure out what you were worried about! I think the strong horizontal lines are the main thing here, and it's looking really good. No worries! It looks beautiful and fun with them not quite lining up. This amazes me, great job! Wander away. I love it. This is coming along very beautifully! 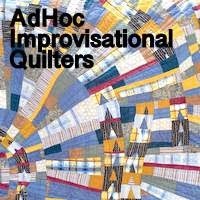 I love this quilt-in-the-making - I have just been sitting at the computer, cup of tea by my side taking in your new layout and I find it has an incredible calming and restful feel, I'm looking forward to your next step! I didn't even notice that one circle until you pointed it out. I love it! That top right circle doesn't look out of kilter at all, if anything its acting as a keystone perhaps! Funny thought. This reminds me of PacMan. I love the colors and shapes, especially the upper right and lower left. But then I'd miss the longer runs of small circles if you removed them all. Thanks for sharing your progress. It is all very well balanced. In my eyes the colors need a bit balance to calm down and show their power. Even though I have been watching the progress on this quilt, and have liked it all along, when I first pulled up this post, I thought "wow this is really nice". This layout looks great. Maybe it is the grid that makes it very coherent. But do stay loose - none of these look out of place. I haven't begun putting my circles together because I am not sure what I want to do, although there is an idea stewing in my brain that I'm liking more and more. Your arrangement is fabulous. I am not sure even one is off-grid. At least, I can't find it with certainty. Love the colors and fabrics! Joyous colors in organized fashion if beautiful and fun to work outside the box.